^ Therrien, F.; Henderson, D.; Ruff, C. (2005). "Bite me – biomechanical models of theropod mandibles and implications for feeding behavior". In Carpenter, K. (ed.). 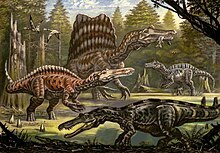 The Carnivorous Dinosaurs. Indiana University Press. pp. 179–230. ISBN 978-0-253-34539-4.